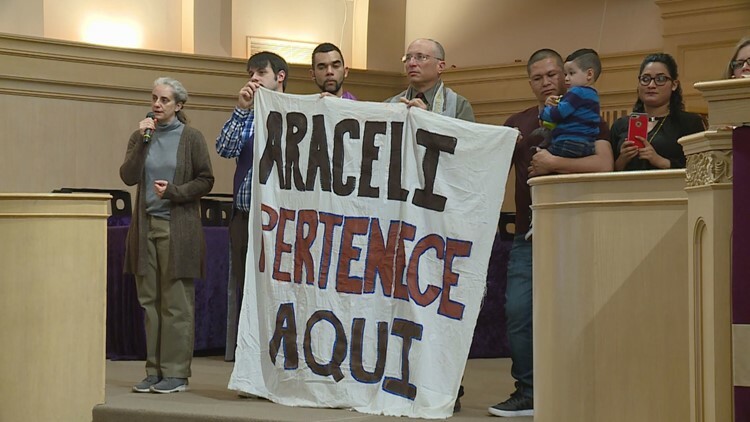 Parishioners at the Park Hill United Methodist Church held a rally Sunday in support of a mother who has been living there for 20 months to avoid deportation. DENVER — Parishioners at a Park Hill church held a rally Sunday to support a mother of three who has taken refuge there for 20 months to avoid deportation. Araceli Velasquez came to the United States illegally from El Salvador. She fled the Latin American country in 2010, when she was 19. She said she initially turned herself over to immigration and asked for asylum. After a month-and-a-half, she said she was released and met her husband. The pair had two children. In 2016, the government denied her asylum request, but she was given a stay of deportation because she was pregnant with her third son. Her original stay of deportation expired in July 2017, and she’s been in Park Hill United Methodist Church and the adjoining Temple Micah ever since. “Part of the reason that I put my face out there and do these interviews is because if I don’t do it, the public won’t know what’s happening to me and other families like mine,” Velasquez said through an interpreter. Sunday’s rally came on the same day that the White House announced it will cut off aid to Guatemala, Honduras and El Salvador because of concerns from President Donald Trump these countries aren’t doing enough to prevent migrants from crossing into the U.S.
Velasquez said she will stay in sanctuary as long as necessary because she feels El Salvador is too dangerous for her children. Staying in the church protects Velasquez, since current immigration policy considers places of worship and schools “sensitive locations.” In most cases, ICE will not arrest, interview or search someone there. Eleven churches in Denver offer asylum.